As the African nation continues to expand and the need for energy grows, geothermal, wind and other forms of renewable energy just might fit the bill. Kenya – Take a booming economy that has a growing appetite for energy and add to it a crippled energy supply line that is forever at the mercy of the elements and frequent power cuts and you will get a need for more renewable energy. Faced with a myriad of energy problems and challenges that risk the economic expansion of this East African nation, renewable energy is the buzzword that has electrified the energy sector in Kenya. Kenya currently has an installed energy capacity of about 1,300 MW against a demand of about 1,100 MW with more than 60 percent of energy generated coming from hydro. This has over the last few years proved unreliable as the pangs of climate change hit closer home and the rain patterns have turned erratic. Being a regional economic powerhouse, Kenya has been racing against time to seek out new sources of energy to power its growing economic might in the region. Renewable energy is quickly proving to be one of the better options due to its lower costs and the availability of the natural resources needed for renewable power. As a result of this, the Kenyan government has recently re-evaluated its power policies and is now encouraging the use of renewable energy for both industrial and domestic use. And to help spur its development, the Kenyan government is not only offering incentives to companies to invest in renewable energy production, but it is also leading the way in a planned $8 billion capital injection into renewable energy generation. According to Eddie Njoroge, the CEO of the Kenya Electricity Generating Company (KenGen), Kenya has the potential to install more than 2,000 MW of renewable electricity over the next three years under the green energy initiative championed by the government. According to Njoroge, Kenya has the potential to install about 800 MW of wind power and 500 MW of geothermal power over the next two to three years. Other identified renewable energy sources include biomass, hydro and municipal solid waste. The government, says the Ministry of Energy Permanent Secretary Patrick Nyoike has already singled out locations in Olkaria (about 100km west of Nairobi) and Menengai, (outside the city of Nakuru) as suitable areas for the development of geothermal power. 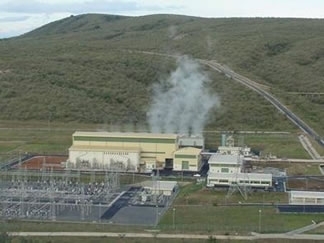 Olkaria currently hosts three geothermal power plants. Once new geothermal power plants at Olkaria and Menengai are commissioned, notes Nyoike, geothermal power capacity will increase by 490 MW. Kenya is one of the few African countries that have successfully tapped geothermal energy. According to Dr. Silas Simiyu, the CEO of government-founded Geothermal Development Company (GDC); there are at least 14 high potential sites in the expansive Rift Valley Province that have been identified for geothermal power production. This, he says, will push down the cost of power as the GDC will sell power to the Kenya Power and Lighting Company (KPLC), the firm that retails power to consumers, at a reduced price of between US $0.04 or 0.05 per kWh. To get the ball rolling, the Kenyan government has allocated about Kenya Shillings (Kes.) 11 billion [about US $137.5 million] in fiscal year 2010/2011 towards the development of geothermal power in the country so as to boost installed capacity to 500 MW in three years’ time. The government is also betting big on wind power. Already KenGen has set up a 5.1-MW wind farm in Ngong on the southern outskirts of Nairobi, which was commissioned last September. The company has plans to erect a second 10-MW wind farm in the area, estimated to cost (Kes) 2 billion [about US $25 million]. The government is also encouraging private companies to set up wind farms. The African Development Bank pumped more than $400 million into what is set to be the biggest wind farm in Africa. The 300-MW wind farm will be constructed in the northern frontier district of Turkana under the Lake Turkana Wind Power Company (LTWP) and is set to go online by July 2012. According to Carlo van Wageningen the LTWP Chairman, the company intends to erect 360 wind turbines in northern Kenya each with a capacity of 850 kW. Kenya, notes van Wageningen, possesses a huge potential to generate even more wind power. LTWP is a Dutch consortium that has leased about 70,000 hectares in Turkana to develop the wind farm. According to van Wageningen, the Lake Turkana region has consistent strong winds that blow year round between the Kenyan and Ethiopian Highlands at speeds exceeding 11 meters per second, something akin to “proven reserves” in the oil industry. Once commissioned, LTWP will construct a 300-mile transmission line to connect the wind farm to the national grid. There are plans to expand the wind farm to increase generation capacity by 2,700 MW. According to the Nairobi-based United Nations Environment Program (UNEP), Kenya has the potential for up to 3,000 MW of wind, especially in the wind-rich northern frontier districts. Besides Kenya, only Morocco and Egypt have successfully tapped wind energy in Africa. The government is also looking at other technologies to help turn Kenya’s energy sector fully green. One of these technologies includes transforming the millions of tones of solid waste generated in the country into energy. While speaking at the recent Green Energy Conference held in Nairobi, Kiraitu Murungi, Minister of Energy said that the massive solid waste generated every day in the four major metro cities of Nairobi, Mombasa, Kisumu and Nakuru could power a 100-MW plant. Private companies are also being encouraged by the Kenyan government to turn to green energy production for their industrial productions. Mumias Sugar Company (MSC), the largest sugar milling company in Kenya, is perhaps the best example of industrial green energy production in Kenya. The company has installed a 34-MW electricity plant that is fueled with byproducts from its sugar milling processes. It uses a portion of the energy it generates in its industrial operations and sells the rest to the national grid. According to Evans Kidero, the CEO of MSC, the company produces electricity from the sugarcane byproduct bagasse. The sugar-belt region in western Kenya, says Kidero, possesses a huge potential of co-generation as 100 tonnes of crushed sugarcane produces more than 17 tonnes of bagasse. Moreover, notes Kidero, the cost of co-generation from sugarcane milling is less than half the cost of generating electricity from imported petroleum and natural gas. Energy experts agree that the rapid expansion of the Kenyan economy will require more energy to power its growth. The Ministry of Energy estimates that Kenya will need an installed capacity of about 2000 MW to meet peak demand in the next four years. This is expected to more than double to 4,000 MW by the 2020. And by 2030 this East African economy seeks to be a middle-income economic giant that is powered by green energy. Denis Gathanju is a freelance journalist based in Africa.